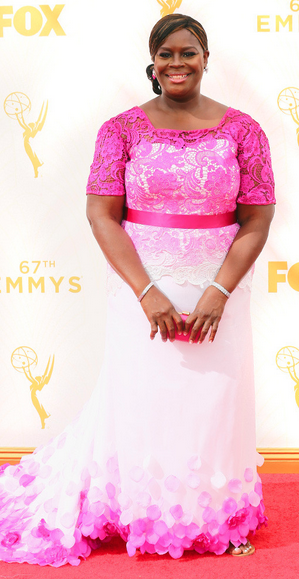 Welcome to the Red Carpet Recap! I've missed this so much - it's been way too long since I've done one of these so I'm thrilled to be back at it. The red carpet looks tonight did not disappoint. Let's start off with a doozy, shall we? Heidi. There is about 7 different things going on right now. And the color isn't helping. WHAT IS THIS. Sarah Hyland is on point, per usual. If you're competing for most beautiful couple, WE GET IT. YOU WIN. STOP. I don't like that third strap, but she is absolutely darling. I like the dress. I like the shoulder thing. I don't like them together. I'm not sure who this is, but I like that she decided that her hand pose should be a heart. Well just give her a pointy hat and she's got herself a Halloween costume! Who is this beautiful girl? Oh! It's Lady Gaga! And she's not wearing a dress made of meat! What a marvelous improvement this is! She looks beautiful. 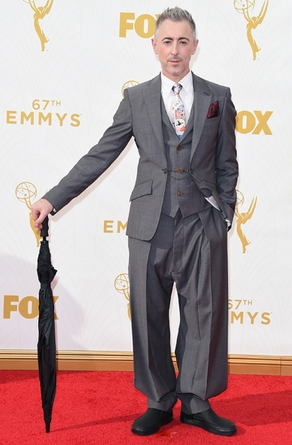 LET'S STICK WITH THIS LOOK, SHALL WE?!? At first I got angry when I saw this pic cause I wanted to know who that home wrecker is walking the red carpet with William H. Macy. And then I realized that it's Felicity Huffman with brown hair and she is unrecognizable. But also kinda fabulous! I'm not sure why, but the colors and pattern of this dress reminds me of that old store in the mall, Gadzooks. OLIVIA POPE I MISS YOU PLEASE HURRY BACK TO ME I HAVE SO MANY QUESTIONS AND I AM ANXIOUS FOR THURSDAY NIGHT TELEVISION AND ALSO YOU LOOK AMAZING OKAY THANKS BYE. Sweet honey child - those pants do not belong with that little top you have going on there. I'm not sure who advised you that all of this was okay. Pick a direction and stick to it. You can't do two things at once. LOVE this look on Maggie! Regina King is one of my favorite actresses. And if this gown went all the way to the ground, it would be one of my favorite dresses. When she was slouching in her chair wearing a hoodie.... oh heavens she makes me laugh! HE'S WEARING A NAHVY BLUE TUXAHDO. She is quickly becoming one of my favorite people. So ridiculously funny and talented - and she looks beautiful! 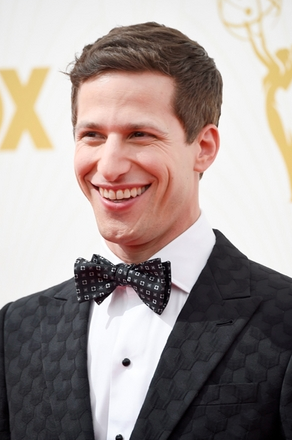 And the textured jacket award goes to Mr. Andy Samberg! But look! 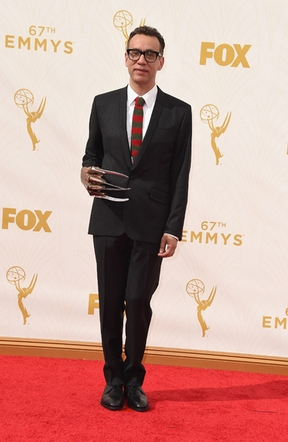 Fred Armisen came with a Wolverine hand which totally makes sense! Is he about to burst into a song and dance number? Perhaps with tap shoes? Can we just revisit this for a moment? I AM SO CONFUSED. This is Andy Samberg's beautiful wife and she may be wearing one of the oddest things I've ever seen. What is happening on her chest? Why is it there? Is it a picture frame? And the winner of the best earrings of the night goes to Julia Louis-Dreyfus! I don't know who this is but I've named her Peppermint Patty. The top of this dress is very mother-of-the-bride and the bottom of this dress is very flower girl. 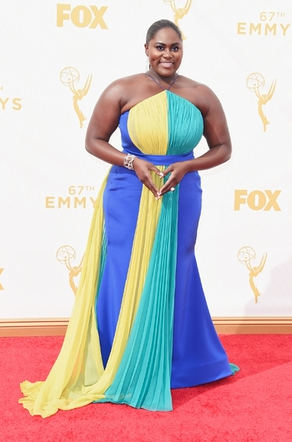 But Retta is hilarious so I don't really care what she wears! THERE IS A STRUCTURAL ISSUE HERE. One side of this dress has fallen down entirely. This bothers me more than I can fully explain. Mindy really doesn't want anyone to take her purse so she labeled it with a very big font. She also matches the wallpaper which is an added plus. Who was your favorite look for the night? Can anyone tell me what is going on with Heidi's dress? Did you also feel like Andy's jokes fell flat? Let's discuss! 31 Weeks Pregnant - An Update!